Where do I use my Easirent voucher code? Find a promo code you would like to use on NetVoucherCodes, follow our link to the Easirent website. In the Vehicle Reservation section on the left of most pages enter a pickup and return location and dates you would like to hire the vehicle. In the next box enter your code and click 'Book Now'. Follow the on-screen instructions and complete your order for less. 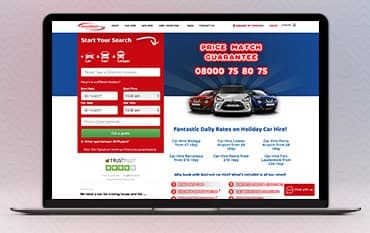 Easirent is a great service if you're looking to hire a car or van for services near your home or for lifts to places around the UK like airports. With vehicles from trusted brands and a variety of cars and models available you can find a car that's ideal for you for an affordable price from a company that you can trust 100%. Easirent operates an impressive fleet of 2500 vehicles in the UK & Ireland. They aim to cater for every customers needs, whether it is a small car or 7-ton box tail-lift truck. All of Easirent's cars are in excellent condition or brand new and they aim to do everything they can to make customers as comfortable as possible. Easirent has some very notable names in their fleet, including Audis, BMWs and Mercedes which they can offer as a more prestige package for an affordable price. Economy car hire starts with Easirent, one of the most affordable car hire companies in the UK. Economy doesn’t have to mean a lower-specification car, it simply means getting the best deal on the market. With Easirent you can schedule cars for pick up and drop off times at places like airports, including Heathrow. Simply enter your selected times and dates of your specific car hire and receive a list of economy cars and prices to suit your budget. Easirent will do everything they can to make you as comfortable as possible and to ensure that your hire goes smoothly from fitting your child seats to folding down the back seats for all your luggage to fit comfortably. So, you can expect a great hire car and easy travel from start to finish with Easirent. Easirent’s fleet of cars is brand new, with the range of cars including luxury brands, 7-seater family cars, small cars and saloons. If you have any special requirements they will aim to take extra care to meet them and always promise 100% customer satisfaction. Whether you are hiring a small Fiat 500 or a luxury Audi, Easirent treat every customer with the same respect and appreciation and hope you find hiring a car with them to be a pleasant and easy experience. When you book your car hire now, there’s no need to pay the costs until later, plus free cancellation is also available. If you want to receive a different quote to any online simply email the Easirent team for more information, help and support on your car hire. As well as Heathrow you can also receive car hire from Gatwick Airport. Perhaps it’s a van you need if so you can find cheap van hire from Easirent also. Cheap van hire has been something Easirent has prided itself on for the last 25 years. They stock a huge range of vans from removal vans, tipper vans and transit vans. All vans come from trusted suppliers such as Ford, Peugeot, and Citroen. Hire a van and pick it up from any of the Easirent branches located in all the major cities and at airports across the UK. Yes, if you wish to cancel your booking you can do so via the 'Manage' page. You will need to provide your booking reference number and your surname view your details. Cancel your Easirent Booking here. Drivers must not be any younger than 23 years old in order to hire a car with Easirent - the maximum driver's age is 75 years. Customers aged between 23 and 24 will also be subject to pay a small fee. Customers should also have not received any more than 6 points on their license. If drivers have had an accident of their fault or had a claim in the past 36 months, they will not be eligible to rent a car. Easirent is a family-run company and the only British-owned car rental company based at most major UK & Ireland airports. Established in Wigan in 1999, their headquarters are now based on the famous Liverpool waterfront. With our Easirent promo codes, you could save more next time you need to hire a car. Easirent's steady expansion has been built on unbeatable value, brand new cars and excellent customer service. They take pride in their customers’ satisfaction, which is why they are a market leader and why customers return to them time and time again. We are constantly on the hunt for Promo Codes for Easirent to help you with your money saving. Our experts check dozens of sites for secret codes including NHS discounts, student sites & social media channels saving you time & money!